In February of 1999 I visited Minneapolis with my then fiancé to decide whether to take a job at the University of Minnesota. It was Valentine’s Day, and unseasonably warm (high 40s F), and there was snowmelt and piles on the ground, but the streets and sidewalks were not covered. We asked the concierge at the then Radisson Metrodome hotel what was the most interesting neighborhood in Minneapolis, for shopping and walking around. He said Uptown. They had a van that takes people to places around town, and you can call for pickup when you are ready.So they dropped us off somewhere around Hennepin and Lake, and we walked around. We went to Majers and Quinn, and Kitchen Window, and then proceeded to walk up Hennepin towards Downtown. I could see downtown and the Basilica, but could not see how to get there. We migrated to the west side of Hennepin, which I knew was a major street, and figured there must be some way across. We eventually came to the Walker, the mess at Hennepin and Lyndale. It seemed as we could not proceed. After about 15 minutes of wandering about, we found a place to cross. We walked through Loring Park and eventually made it to downtown. We proceeded to walk up Nicollet.We found our way to the Hennepin Avenue bridge, and walked into the what is now the East Hennepin neighborhood. Then it wasn’t much. Surdyk’s, Kramarczyk’s, and a broken down furniture store. You could sense it was gentrifiable, but it was not gentrified. There were no gentry to be found. We hit University, which I knew would take me to the University, and we followed that for a bit over a mile, running into Dinkytown. Dinkytown also was pretty depressed at the time, the bridges over the trenches having recently been replaced, which I am told killed some businesses there. It was nothing nothing like the neighborhoods near where we then lived in Berkeley. We then made our way back to the hotel. My then fiancé compared Minneapolis to her hometown of Fresno (which she escaped). That really bit.After seeing other places throughout the world, notably Toronto, London, Manhattan, any continental European city, even Washington DC, I believe the problem with making Minneapolis a first rate pedestrian city is the lack of contiguity. There are some really good walkable sections, but they are not connected well (or at all). Now there are degrees to everything. A one-lot surface parking lot on an otherwise walkable Grand Avenue is not a disaster. But block after block of unmitigated surface parking is a walkability catastrophe. I should be able to walk pleasantly from the St. Paul City Line to the Chain of Lakes via University Avenue through Hennepin to Lake Street. I should be able to walk pleasantly from the St. Paul City Line from the River at Lake Street, all the way down Lake Street. I should be able to walk from the University of Minnesota Campus to the Lakes via Washington Avenue through the City to Hennepin. I should be able to walk from Columbia Heights to Richfield along Central, Hennepin, and Lyndale. I could go on. Instead, I drew a map on Google of some of the most important routes that I should be able to traverse contiguously on foot (feel free to edit, just use a different color). I recognize we don’t have the resources to make every single street in Minneapolis walkable for a long a distance, and frankly some shouldn’t be. We need warehouses, but it’s not worth spending a lot of effort to try to put street-fronting retail in low density industrial areas. But to say we cannot do it everywhere doesn’t mean we can’t do it anywhere. If we organize and coordinate and regulate and deregulate (dare I say “plan”) better, we have the resources to make any (but not every) street walkable. 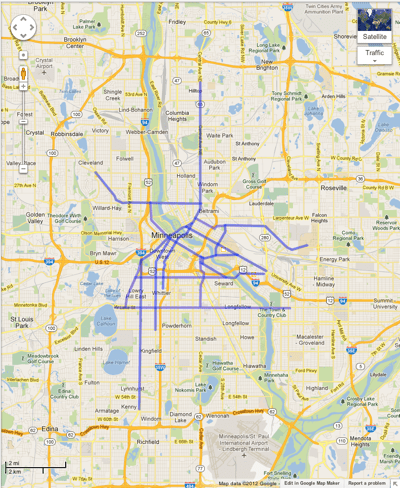 After drawing said map, I realized it was beginning to resemble the Twin Cities Rapid Transit map. But even that has gaps, lines where there are not streetcars, but there should be pedestrian paths, and lines where there are streetcars, but don’t demand contiguous walkability. There are multiple causes of this. I don’t think one is the lack of activity. There are enough jobs in downtown Minneapolis that all the streets should be walkable. However, they are concentrated in a few blocks of very tall buildings rather than more blocks of lower buildings. One of the reasons Washington DC is more walkable is the height limit. This creates more blocks with critical mass, and comparatively few blocks of surface parking. I am not advocating the regulation, just pointing out a positive externality of height limits. Of course if there were sufficient demand for block after block of 50 story buildings (Manhattan), a 10-story height limit would be a dumb idea. Another cause is the success of freeway construction, which disrupted the grid and changed pedestrian oriented land uses to motorist-serving. Air rights over the freeways, freeway caps, could fix that, but the only significant air rights in the Twin Cities are the Twins Stadium and the ABC ramps. The city is much more grid like than dendritic, which creates opportunities, but this needs to be systematically addressed. There is of course a Pedestrian Master Plan, but the problem is not simply the sidewalks (though those should be better), it is the land use abutting the sidewalks. Just as we are concerned about wildlife corridors for animal migration, and greenways for bikes, and continuous limited access freeways for cars, we should ensure there long contiguous walkable sections for pedestrians.